A century and a half later, one might think that everything useful has been written about Gettysburg, that massive, bloody and crucial Civil War battle. But Paul O’Connor finds that a new book published in time for the battle’s sesquicentennial offers many fresh insights. Reviewed by Paul T. O’Connor. GETTYSBURG: THE LAST INVASION. By Allen C. Guelzo. Random House Audio. 22 ½ hours; 18 CDs. Read by Robertson Dean. $42. More than a quarter million people were expected to visit Gettysburg, Pa., this week for the 150th anniversary of the largest land battle in this continent’s history, a bloody three-day clash that claimed thousands of lives, saved the Union from what appeared to be impending defeat, closed the best path to independence for the Confederacy and prompted endless historical, political and bar-room debates. Given the volumes of historical tracts written about Gettysburg, the most obvious questions to ask were whether another was needed in 2013 and, if so, whether it would say anything new. The answer, with regard to Gettysburg: The Last Invasion by Gettysburg College history professor Allen C. Guelzo, is yes. 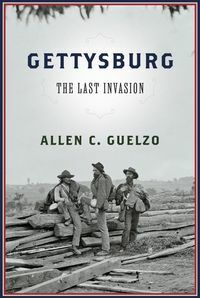 Guelzo’s book, the latest in a long line of Gettysburg histories, recounts, on a minute-by-minute basis, the movement of the troops, the clashes in the various venues and the overall strategies of those involved. He leads us into the battle with a concise and thoroughly comprehensible summation of the war leading up to the Gettysburg campaign, and he leads us away from the battleground with what transpired afterward, recriminations and all. In those regards, this book is an excellent first read for anyone wanting to know the full story of Gettysburg, maybe someone who has seen the movie or read a survey of the entire war. Guelzo, however, raises and makes points that this history buff had not seen presented before. He takes aim, for example, at several of what we today consider to be historical truisms, the first being that Civil War technology had outpaced Civil War military tactics. The war’s high casualties are often explained by the fact that soldiers typically attacked and defended while in line of battle and exposed to enemy fire. This was a military tactic developed when weapons were far less accurate than the rifled guns and cannon of the 1860s. The new weapons, therefore, caused horrendous casualties, according to the truism. He disagrees. Yes, the technology had improved, but the weapons still were not very accurate, they had limited range, and the smoke that they caused quickly obscured the battlefield. Those factors, when combined with the relatively inadequate training of those firing the muskets, meant that the old tactics were still the most appropriate. Guelzo also takes aim at the strongly held belief that Joshua Lawrence Chamberlain saved the day and the Union with his stand on Little Round Top on Day Two. He takes nothing away from Chamberlain and his Maine boys, but he gives equal or greater credit to other officers who were in the same skirmish. How did the myth arise around Chamberlain, then? The others were all killed, leaving Chamberlain alone to promote himself in the postwar era. Our author has much good to say about Gen. Robert E. Lee, but not in regard to this battle. In the end, he places blame for the Confederate loss on Lee, saying that his individual decisions, all defensible choices in and of themselves during the three days of battle, in total didn’t work. He’s also tough on Lee’s underlings, saying that in this battle they did not measure up to superior leadership on the Union side. Guelzo is clearly not of the school that blames Gen. James Longstreet for losing the battle. He mostly praises Longstreet and says that the argument against him is often based on things other than facts. For example, he writes, the third day charge on Cemetery Hill and Cemetery Ridge could not have started early on the morning of July 3, as his critics often say it should have, because the troops that were to be involved had not yet arrived at the battlefield, no fault of Longstreet’s. When it comes to Meade’s Union leadership, Guelzo gives more of the credit for victory to subordinate generals Winfield Scott Hancock and John F. Reynolds, the latter who died on the field on Day One. He also raises serious questions about Meade’s willingness to retreat after the setbacks on Day Two and his allowing politics to enter into his command decisions. One often overlooked player in Civil War history is the secessionist leader William Barksdale of Mississippi, a congressman who worked laboriously before the election of 1860 to ensure Republican success, the defeat of his own Democratic Party and, thus, an open road to Southern secession. He was one of the most inflammatory voices against restraint and for the policies that led to this horrible war. The firebrand Barksdale was a general in the rebel army and led his brigade of Mississippians into an at-first successful charge at the Union line at the Peach Orchard on July 2. But he tried to go too far and too fast. His attack was stopped and he was mortally wounded, dying in a Vermont unit’s field hospital. He reaped what he had sown. Gettysburg: The Last Invasion is an excellent history, one worth reading by either the newcomer to the battle or the repeat visitor to the battlefield. Our author tells the story wonderfully and in full context, and the reader on the audio book version, Robertson Dean, is masterful, also. Paul T. O’Connor, contributing editor, is a university lecturer who is available for freelance writing assignments. Contact him at ocolumn@gmail.com. This entry was posted in American History, History, Military History and tagged Allen Guelzo, Battle of Gettysburg, Civil War history. Bookmark the permalink.